With the advent of Simulation and Analysis software that is increasingly accessible to more engineers, more people are learning about typical problems plaguing users of simulation: clean-up and repair of dirty or (even worse!) corrupted CAD models. Regardless of whether you are running your analysis with ANSYS or tools such as CST, Strand7, Abacus or others; engineering analysts face similar challenges in the geometry preparation phase of a project. Coming to the table to resolve these issues for the everyday engineer is ANSYS SpaceClaim. Fast, robust, intuitive and easy to use; SpaceClaim enables the user to repair, rebuild and prepare their geometry prior to analysis with little to no training. Within just a few hours of being hands-on with SpaceClaim, users from a range of industries and backgrounds have described their excitement at just how capable and effective the software can be to assist them in geometry preparation for simulation. SpaceClaim’s inbuilt Fill tool allows removal and healing of any cuts into the geometry such as chamfers, rounds, protrusions or depressions. Figures below highlights how a protrusion is removed from the main body. Working with large assemblies and thousands of small parts? Use the power selection tool to highlight all objects (i.e. faces, bodies or rounds) that are similar or less than a defined size and delete them. Bolts, washes and holes no longer pose a problem to remove as SpaceClaim easily handles thousands of bodies in just a few clicks of the mouse. A dedicated repair tab allows the removal and healing of objects that may have become corrupted during export, or require a watertight body to be generated. Do you have a corrupted face preventing you from proceeding with your analysis, or perhaps additional, unwanted edges are causing your mesh to be larger than needed? SpaceClaim’s Solidify toolkit can help to delete and rebuild the face, or perhaps search for any split or extra edges that can be removed from your current model. 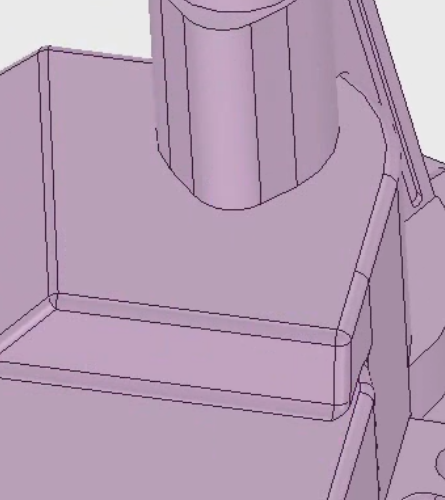 A few clicks of a button and the automated tools identify, simplify and if needed, repair your geometry saving not only your time, but also reducing the requirement for expensive computational power. Although scripting and coding has typically been reserved for the specialist, SpaceClaim is bringing the skill and benefits of scripting to the everyday user. Based off the Python language, SpaceClaim’s scripts are continuously being improved to allow more capability in recording and replaying, equation driven geometry and automated clean-up operations. Maybe your model has a minimum size and everything below can be removed? Record your operations, Fill all the holes under your defined size, save and you can easily implement the same method for all your future models. Automating a repetitive or tedious task is no longer a fantasy and can be achieved with just a little practice. This blog and embedded video cover off on only a few of the numerous capabilities seen within ANSYS SpaceClaim software. Let us know if you’ve seen something that you think would be beneficial to your process, or perhaps you just want to learn more about the capability and see the software live in action. Regardless of your background in simulation and software experience, get in contact with LEAP Australia and let us show you how you could completely change the way you approach geometry preparation for simulation!